What better way is there to start the day? None in my books. She had her breakfast and for once, allowed me to brush out and put ribbons in her hair. Her hair is usually a no-go zone for me. I’m allowed to wash and brush it twice a week and not allowed anywhere close between those times. And today I was not only allowed to brush it, but also put ribbons in it, in honour of her first day. “Yes, I would really like you to wear this skirt. Look, it even matched your top”. And it did! “Well, it’s my choice and my choice is this one”, she said putting the shorts she had chosen on. Win some, you lose some. At least I got to play brush her hair, right? We got the bag, we put on our shoes, checked the weather and left the umbrellas at home, and got on our way. We did the walk yesterday to meet the principal, teacher and classrooms so we knew how long it would take and arrived just in time to have a quick oooh and aaaah. I’m not a crier, I’m not. Not about stuff like this. I used to worry there was something wrong with me but I’ve made my peace with it a long time ago. I’m more of a lie down in a quiet room kind of person when I get too emotional, so I knew I wouldn’t be crying today, and I didn’t. What surprised me is that the media always goes on about mums crying on the first day and yet I only saw dry eyes all around. Perhaps it was because we’ve all come from the community and it’s a very small community where you’re bound to see everyone in the playground once in a while. Or maybe it was because mos of the kids already knew each other from the preschool and saw each other only last week, maybe it’s because there was such an air of absolute excitement and happiness in the air that it was hard not to get swept up by it and get lifted clean into the clouds by the giggles and the chats and the delight n being with old friends and new that the kids just ran around deciding who was going to sit where and do what. We had to get gently shooed out of the room by the teacher as it felt too infectious to leave all that happiness behind. Day one was only an hour long, so a coffee, tea and whatever else later, we were back to pick them p. Boy were they pissed! Roz clearly did not want to leave. Did I mention she had told us to leave the second we got there? 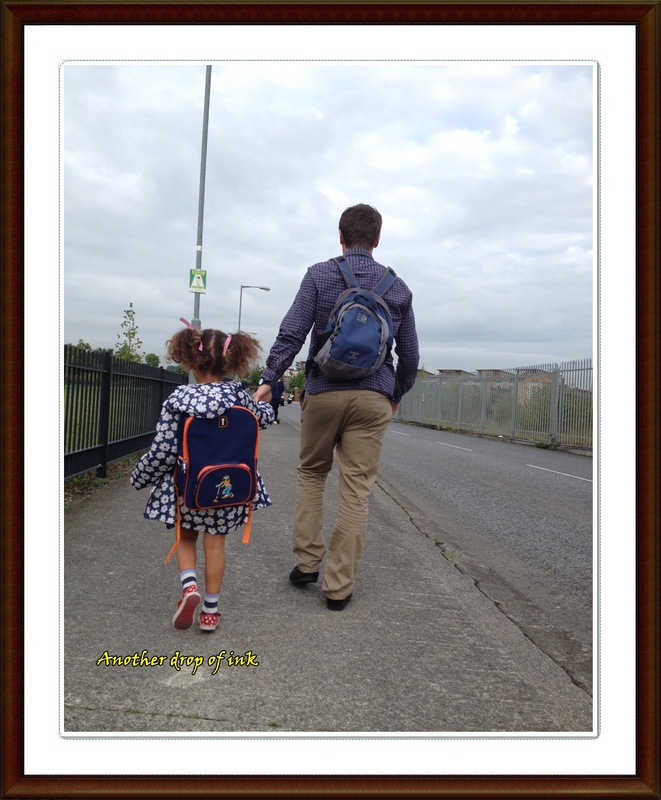 Well, the second we got her to school, she asked very kindly that we leave. We went to the playground, and her and her cousin refused to be separated so they both came over to mine and played and played. And wouldn’t be separated till a promise was extracted from my sister that Roz would go over to their house tomorrow after school to play. Krzys took her swimming in the evening while I finally got a chance to put my feet up and…batch cook even more food for the week, and typically, just as I had my coffee ready and sat down to enjoy it, they returned. Such is life. I am exhausted and glad she had such a great day. It’s wonderful watching her spread her wings that little further away from her little nest. And even though there is a pain of realising she is no longer my baby, there is also the pride of knowing she’s now my little girl. And I’ll tell you one thing, after all that busyness today, it only took about five seconds and she was out cold. That would have been a waaaay better start for sure. 🙂 This one was pretty cool though. What a lovely piece. Went through the same myself. It really is a proud moment for us all. Glad she got on well. Yes those tenses are just the cutest! Thank you Una. I’m glad you guys had a great day soon. Long may it continue. I know I’ll miss the day she figures out all the tenses, they really are so cute with their little mistakes. They really o. Best of luck to both of you next week. Thanks Shareen. She always amazes me with the things she comes out with and there’s so much I learn from her. Best of luc to you and your daughter i two weeks and I’ll be sure to look for a blog post about how you get on. Thanks Sara, they really are so cute when they’re that small. I’m delighted that teachers find them equally cute. Gorgeous, I’m going to be so emoitional next year when my small lady makes the big step to school, its hard to believe they grow up so quickly and school is the first of many adventures they take on their own! It really is, even though logically that’s the only thing they are designed to do. She got on so great today too. Oh Sandra that is great. I hope everything went well for him. I truly enjoyed reading your blog post and I love how much of an opinion your daughter has eg on her hair or clothing. I think it is adorable. I am not a mother myself but this sounds like the perfect first day at school day. Sometimes it can be a complete pain but I do love that she can make up her own mind. Thanks for commenting. That’s a lovely way to be described. I do hope she holds on to those attributes, and you held on to yours too. Isn’t it just the cutest? I hope secondary school goes well for him. That’s a really big step. Next story The end is really f*****g nigh! Previous story To make an end is to make a beginning….